"What’s my DNA?" Virgil Abloh asks to an overflowing auditorium at the Harvard University Graduate School of Design. Abloh goes on to provide his audience with a "cheat code"—advice he wishes he had received as a student. He then unpacks a series of “shortcuts” for cultivating a “personal design language.” Trained as an architect and engineer, Abloh has translated the tools and techniques of his student days into the world of fashion, product design, and music. His label, Off-White, works in seeming contradictions, marrying streetwear with couture, collaborating with brands like Nike, Ikea, and the Red Cross; musicians like Lil Uzi Vert and Rihanna; and "mentors" like Rem Koolhaas. Impervious to hurdles ("They literally don’t exist. "), Abloh takes us behind the scenes of his design process, sharing the essentials of editing, problem-solving, and storytelling. He paints a picture of his DNA, and then flips the question: What’s your DNA? 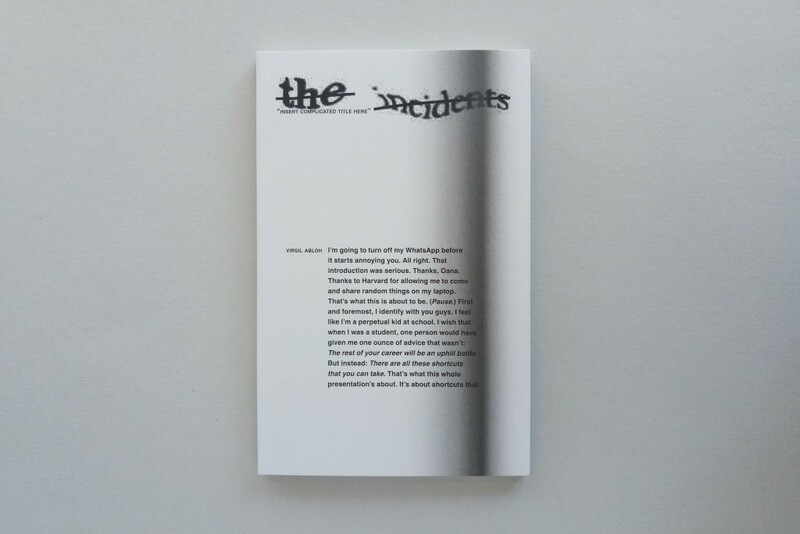 "Insert Complicated Title Here" is the sixth title in the book series The Incidents based on uncommon events at the Harvard University Graduate School of Design from 1936 to tomorrow.